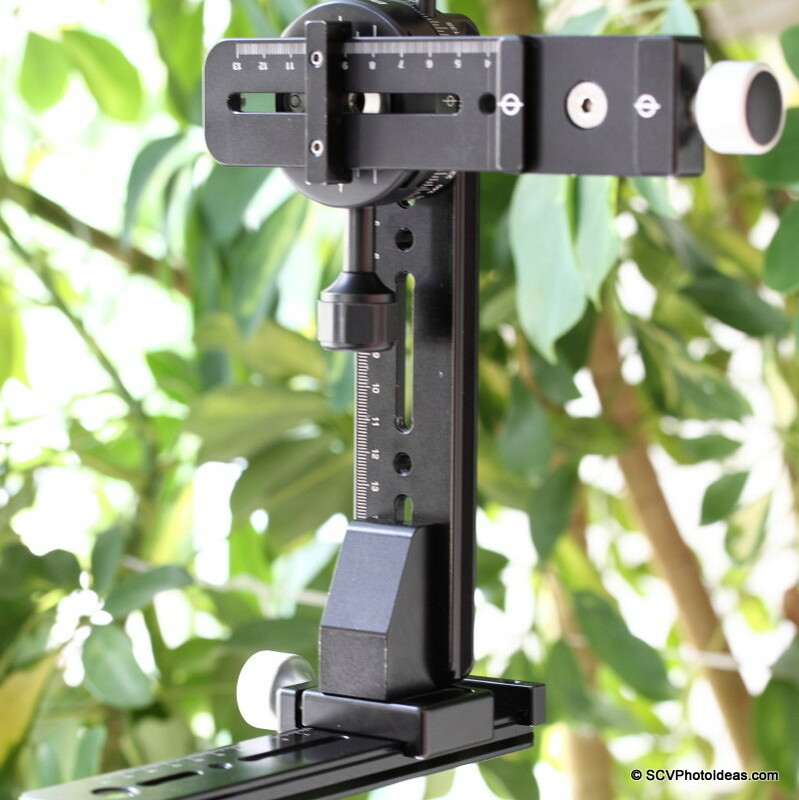 In my quest for a Multi row Panorama (or Panoramic) Head, I came across many solutions but either I had to pay a small fortune for a rigid and vibration free construction or risk a lot of work on a cheep copy ending up with blurred images. 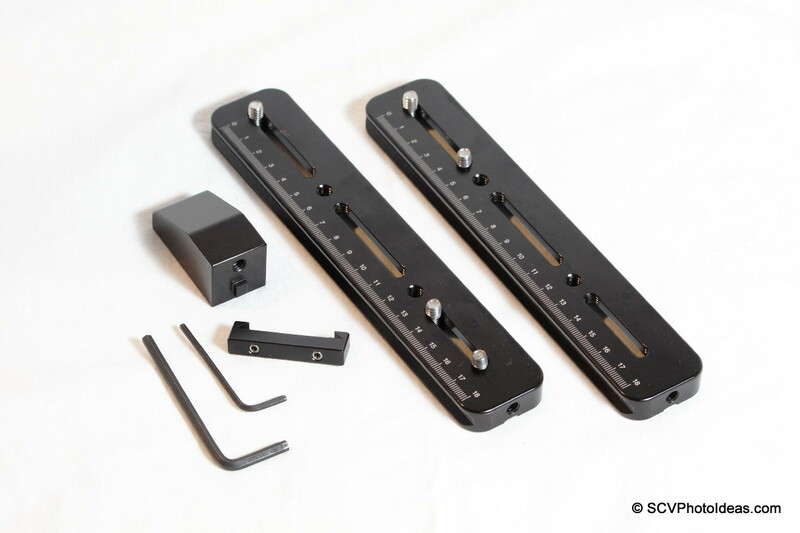 Arca-Swiss® compatible rails with double dovetail and scales. 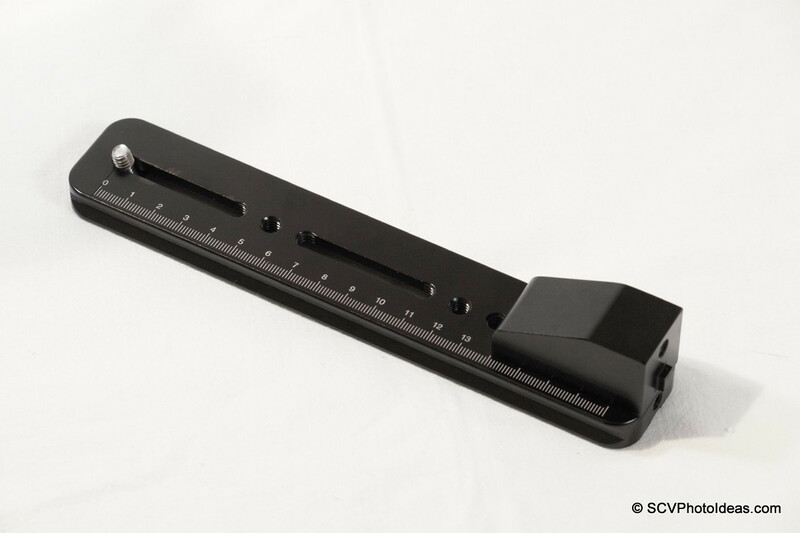 At least 20cm (8") long rails that would accommodate a Gripped DSLR (without having to remove the Grip in order to fit on the Panorama Head). 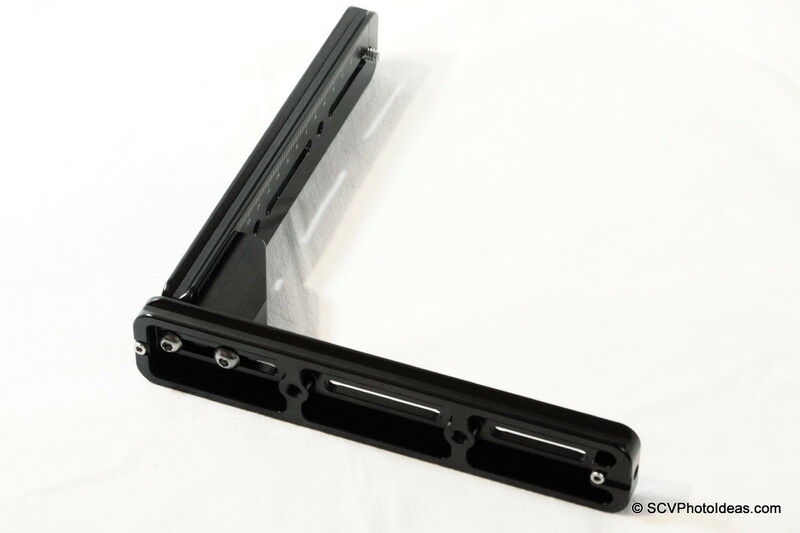 Sturdy construction and rigid bonding between parts in order to avoid any torsion under load or any resonance derived from vibration. And last but not least keep the volume and weigh low for ease of transport. 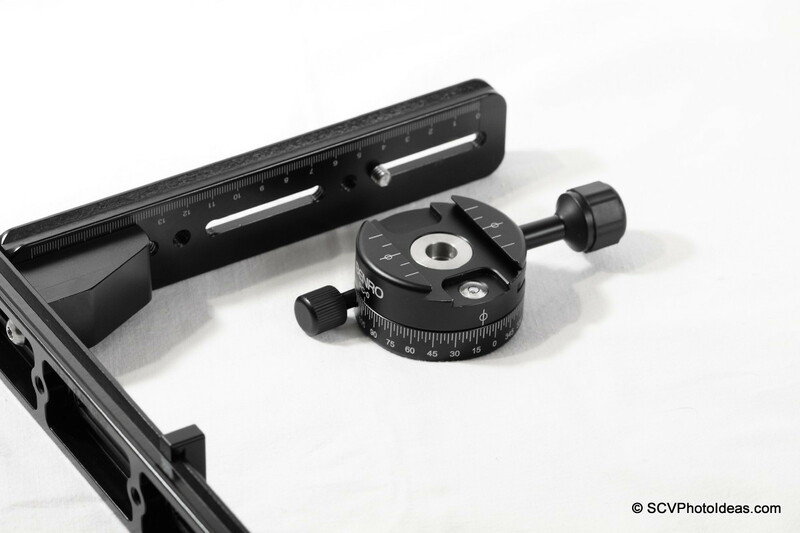 I had already picked the Benro Panorama Clamps for the control of the vertical and horizontal motion, had also created a convenient Nodal Rail, and after a nice cooperation with Chris Hejnar of Hejnar Photo we came up with the proper rails and connector, that were rigid enough for the purpose. 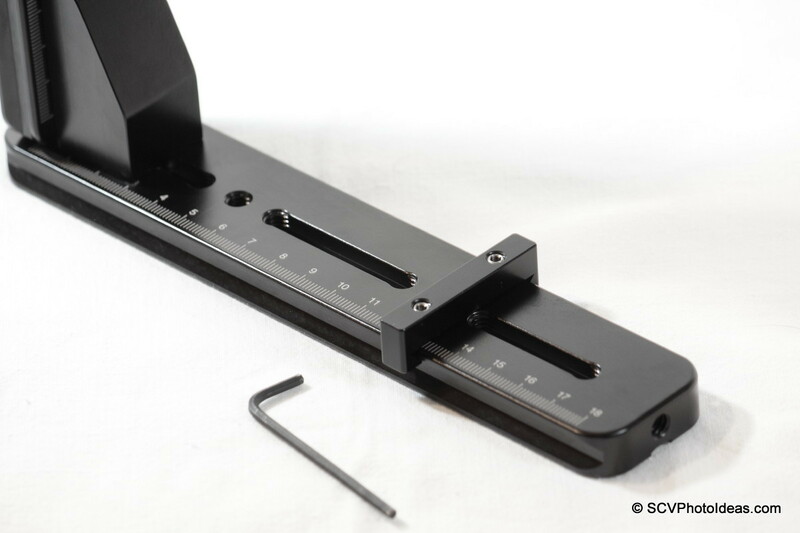 Hejnar Photo G010-80 8", 1/2" thick rails with a front 1/4" tapped hole and decimal scales, Five 1/4"-20 hex socket captive screws, one G103 modified 90 degree block, an Index bar with soft tipped screws and the appropriate Allen hex keys for the 1/4"-20 screws and the soft tip screws. 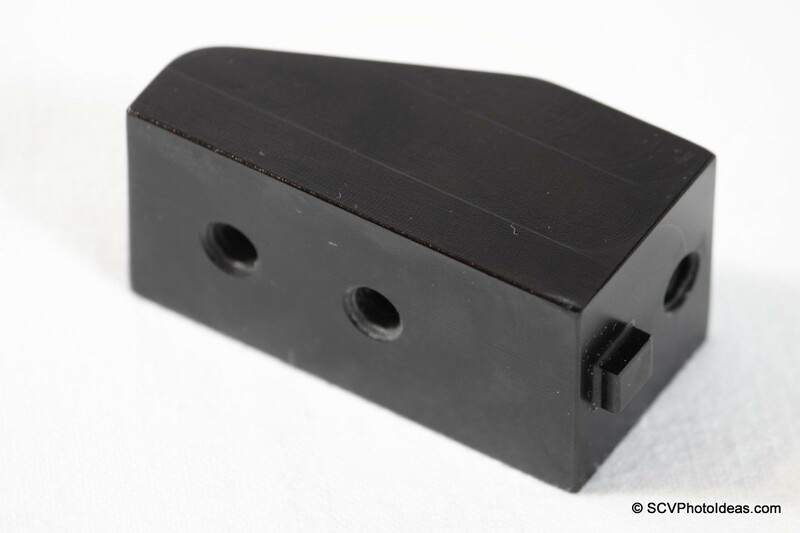 Two 1/4" captive screws are needed for the attachment of the modified 90 degree block. 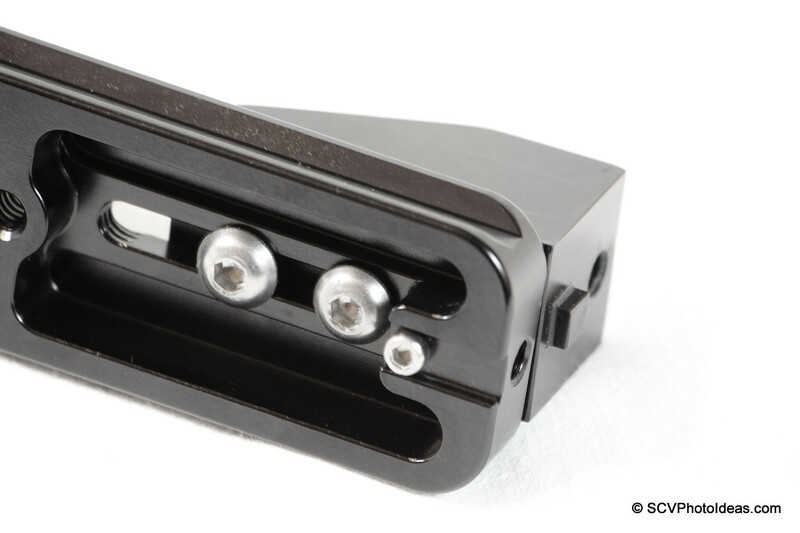 Also shown here is the M3 stop screw. The difference in this block from other Hejnar photo 90 degree blocks, is that it has 2 x 1/4" tapped holes on the vertical side thus taller and 1 x 1/4" tapped hole on the horizontal plain accompanied by an anti twist island. Fitting of the 90 degree block on the vertical Rail first. 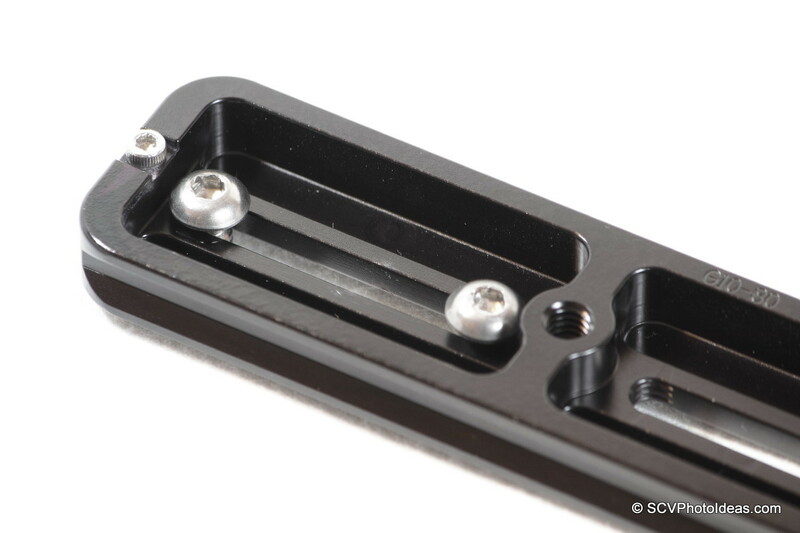 Choosing the side of the Rail with the front 1/4" tapped hole, so it will be fixed with 2 x 1/4" captive screws on each side. Screws fitted but not fully tightened yet. 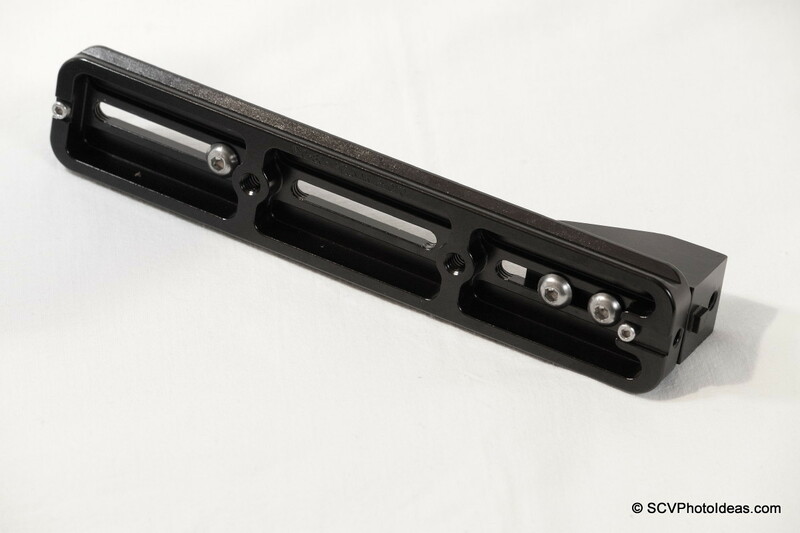 Then the horizontal (or bottom) screws are fitted one on the Block and one on the Rail. c. Finally the one fitted to the Rails "front" hole. 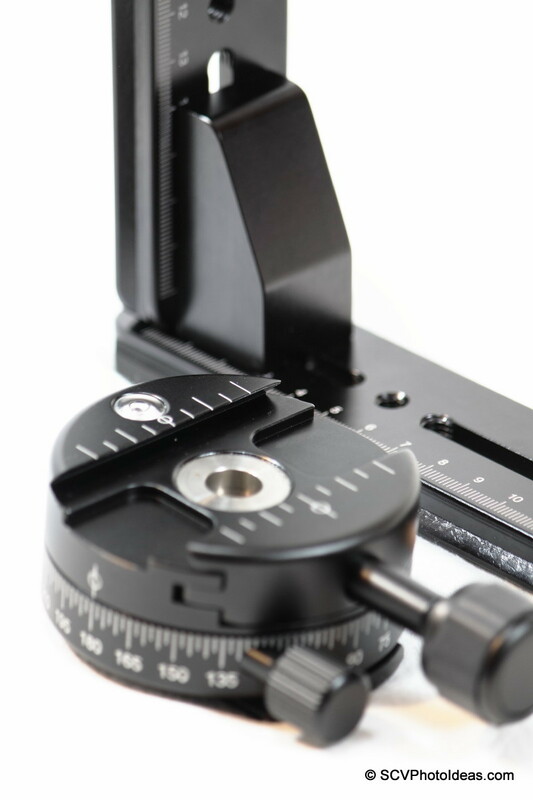 One necessary Index Bar is on the horizontal Rail to mark the lens center to match the head pivoting point. 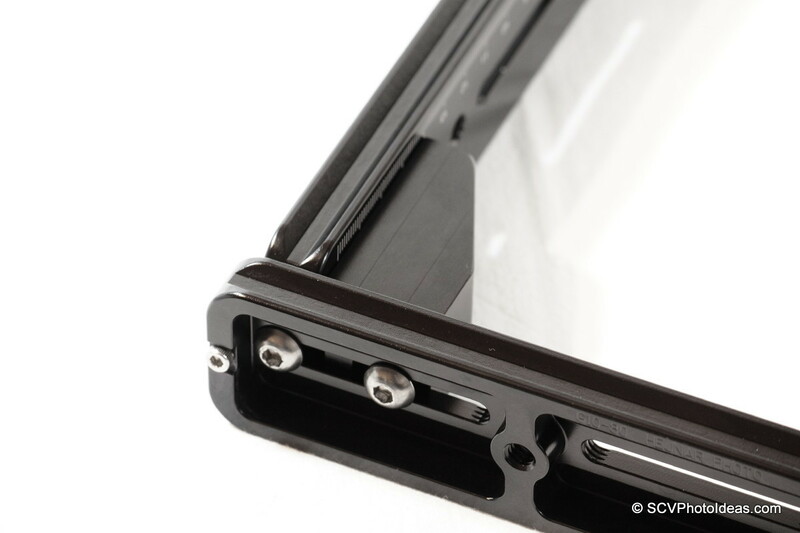 An 1/4"-20 to 3/8"-16 converter is needed in order to use the 1/4"-20 captive screw on the rail. ... and tightened with a big flat screw driver. 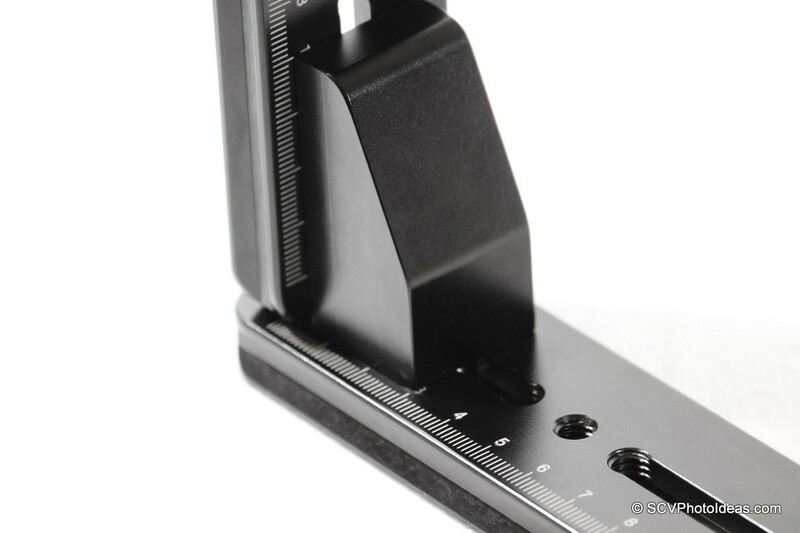 The position on the vertical rail has to be chosen according to the camera and lens combination to be used. 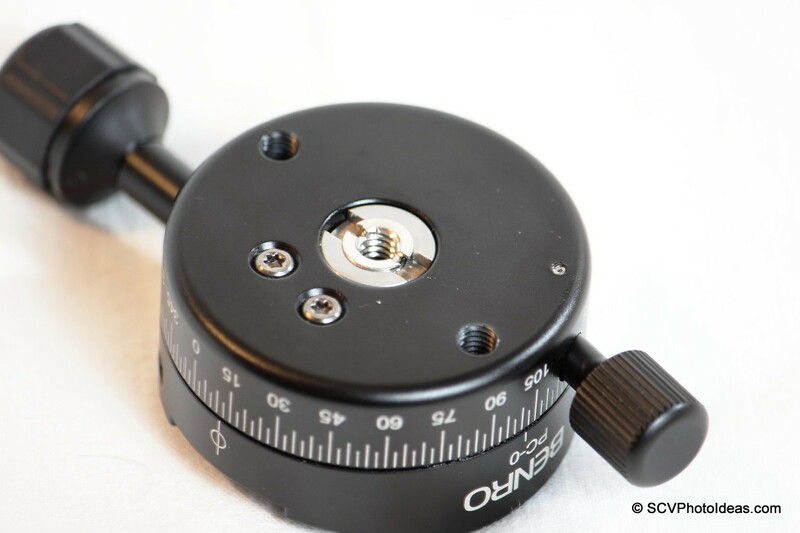 For better response to vibration the lower the better, keeping in mind to leave ample room for the nodal rail + clamp screw knob when it will turn vertical in order to shoot a zenith point. 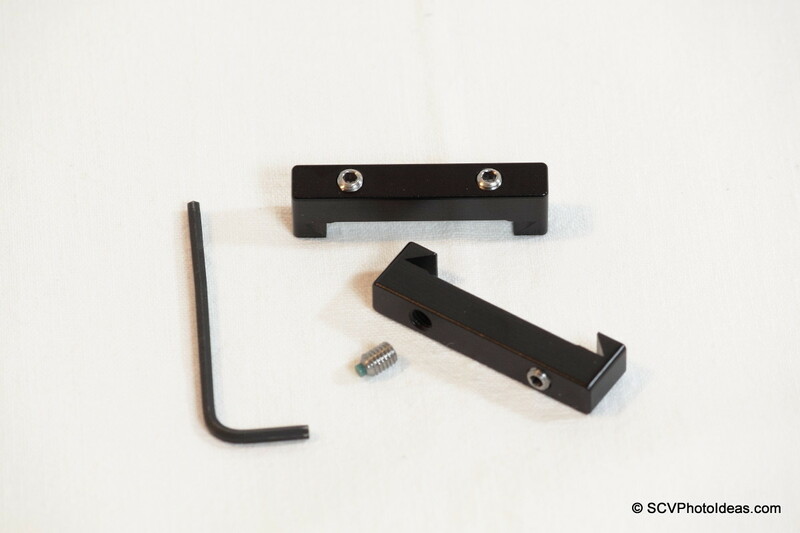 Vertical Panorama clamp fixed in place. 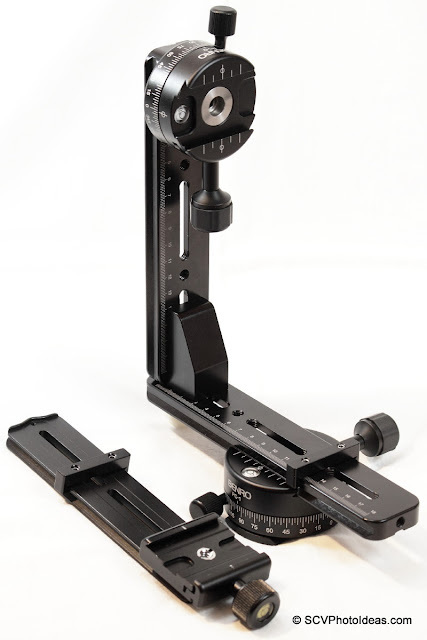 Closer view showing the alignment of the Benro PC-0 Panorama clamp. 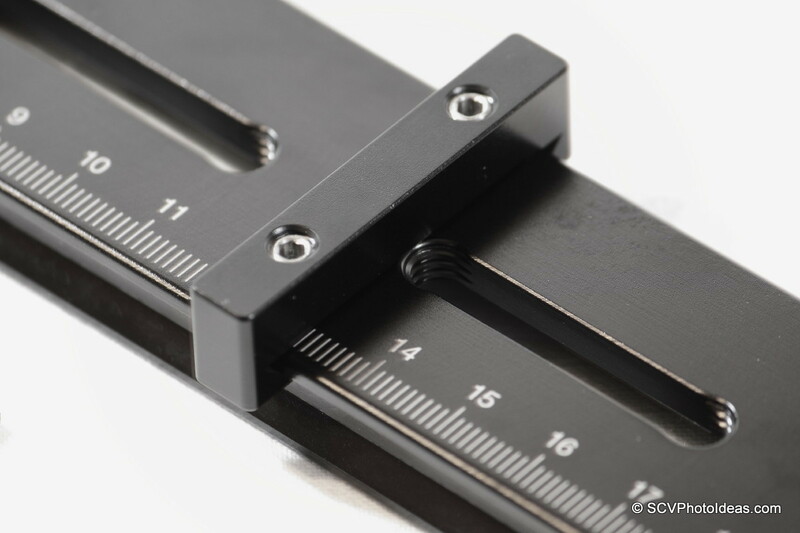 Care should be taken so the zero (0) mark is placed at a 90 degree angle to the vertical rail before tightening the 1/4"-20 captive screw from behind. 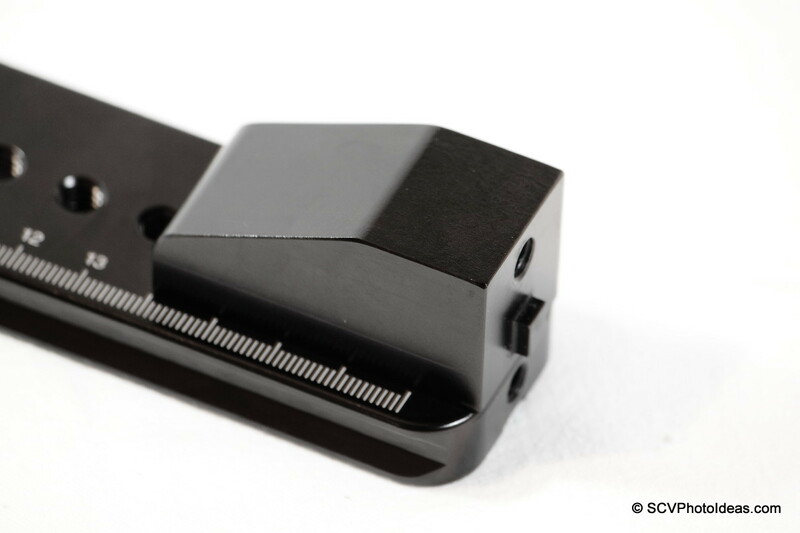 Then is time for the horizontal Panorama Clamp. 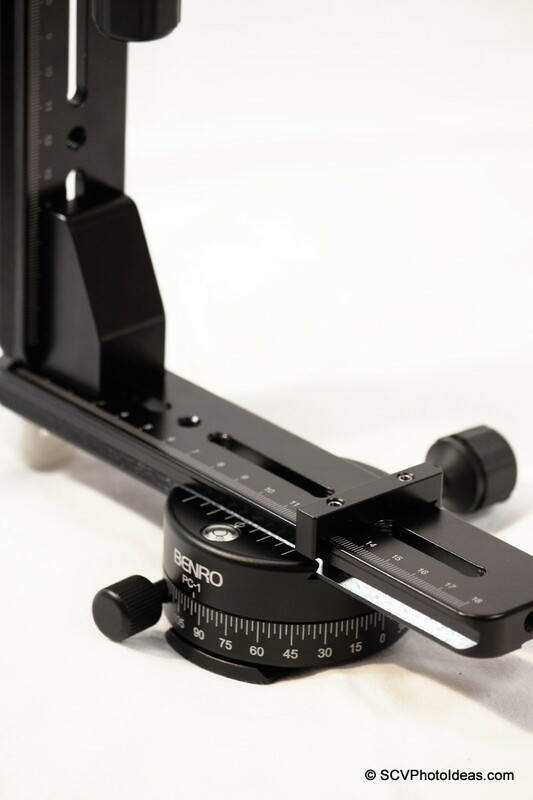 Benro PC-1 was chosen for the base since it can hold more weigh and of the bubble level being visible when the Rail is clamped. 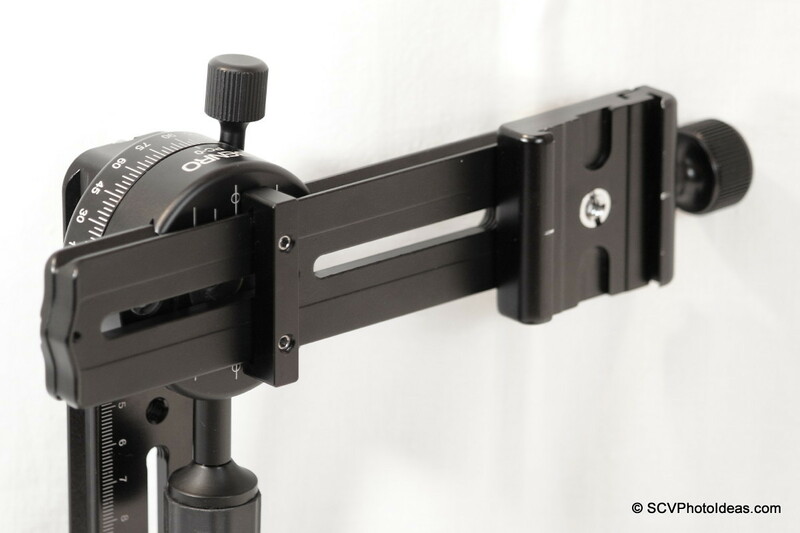 A nodal rail like the one I had described earlier in Create an Economy Nodal Rail has to be attached also on the vertical Panorama clamp. 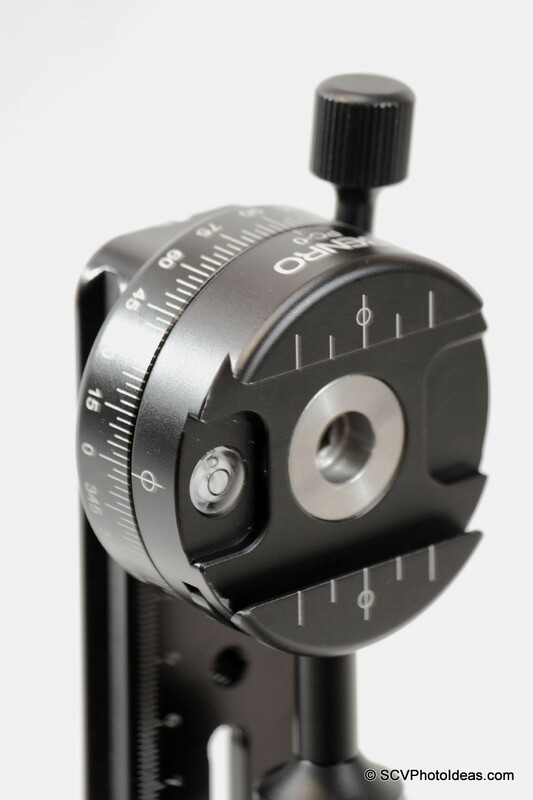 Positioned and locked to the predetermined Nodal point by the index bar. Finally the finished whole structure. Total weigh just 1,134 kg (or 2.5 lbs) ! 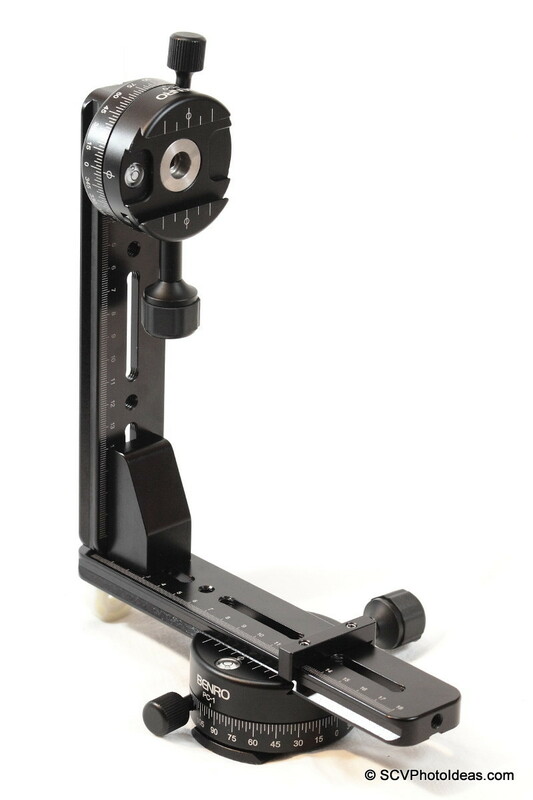 as well as Using a Panorama Head as a Gimbal. 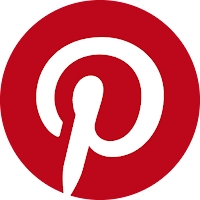 You may find some panorama samples under the Panorama-Photos label. 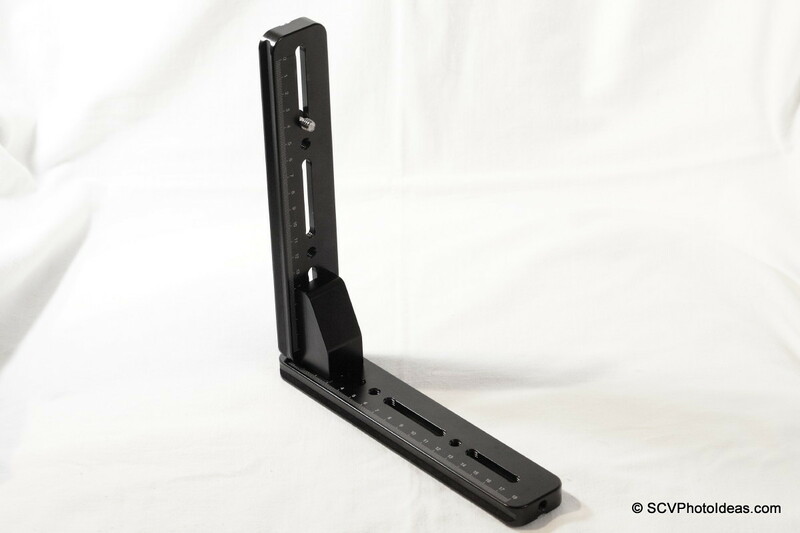 Note: The Nodal Rail pictured in this post was originally prepared for my Single Row Panorama Head. 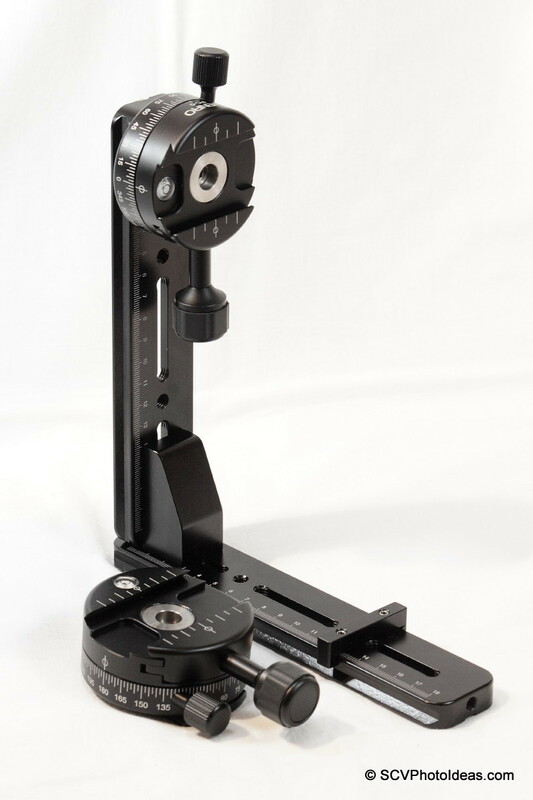 I need to say that Hejnar photo has available Nodal Rails with clamp at a very competitive cost which I trust would be of equal or better quality. As of April 2012 the Hejnar PHOTO G010-80 rail has a minor but very useful update. 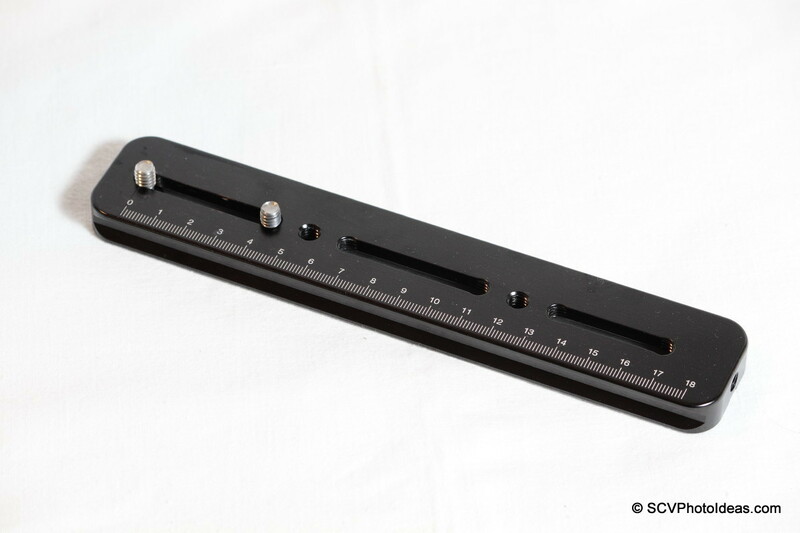 It has decimal scales engraved on both sides, on top, at full length. 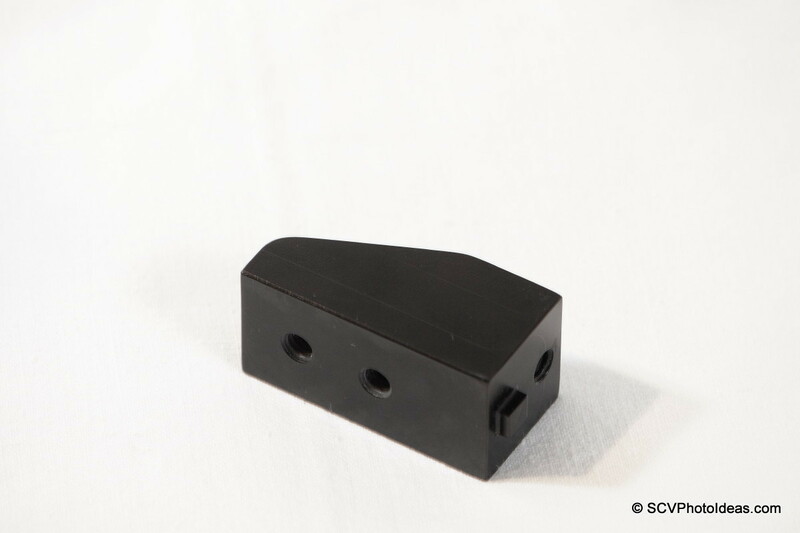 In the photo on the right G010-80 8" rail is depicted stand alone and with the also updated G103 90° block attached. I hope you found this idea useful, thank you for viewing. 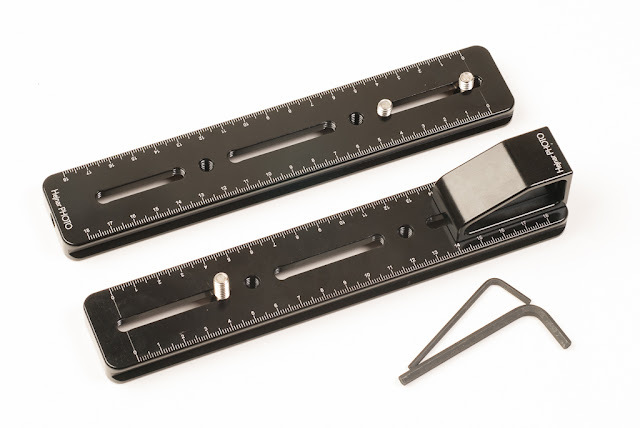 The latest versions of all Hejnar rails and components as well as the The S.C.V. 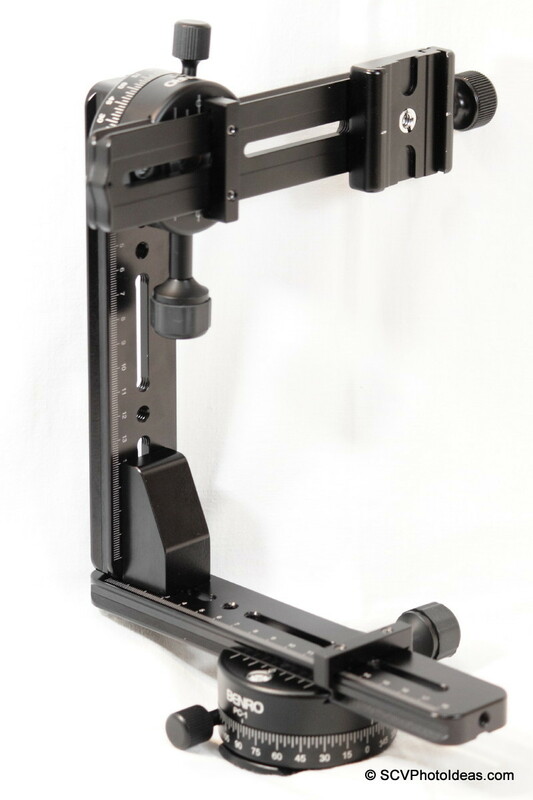 Panorama Package with 6" nodal slide or an S.C.V. 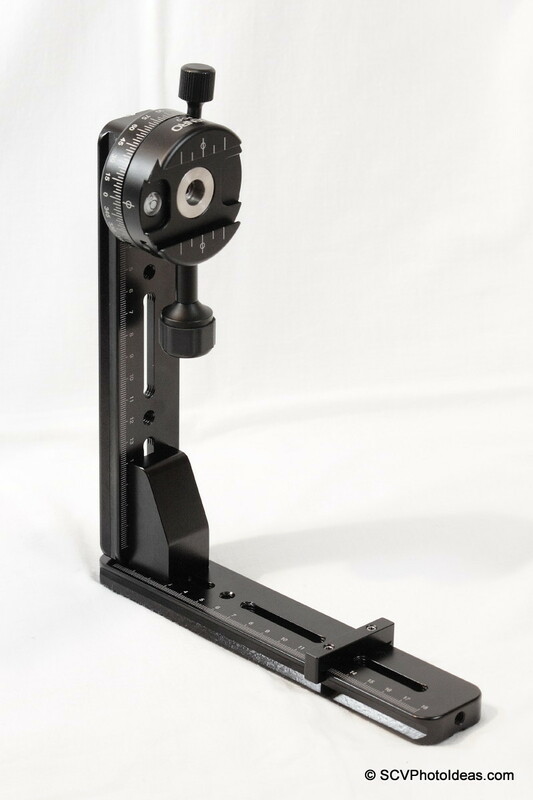 Panorama Package with 8" nodal slide are available at the Hejnar PHOTO Store also containing the latest version of all the products. 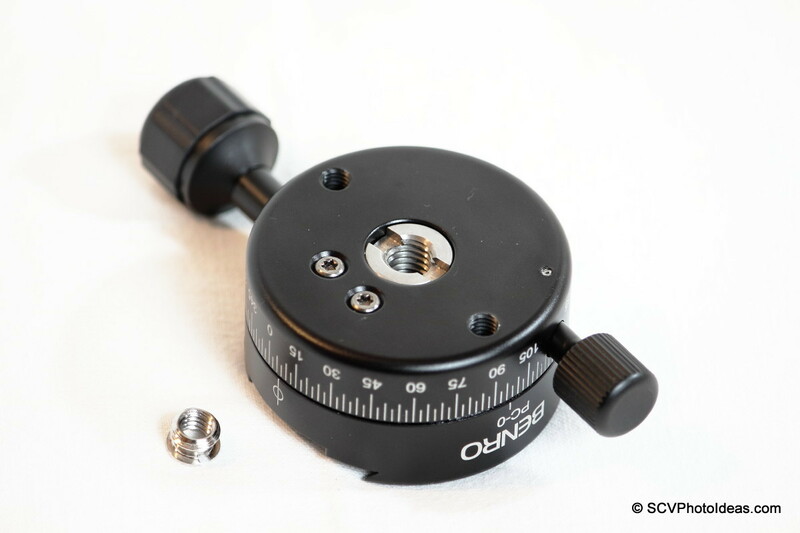 While the estimated cost of both the Benro PC-0 and PC-1 Panorama clamps is US $ 200.00-230.00 shipping included from eBay and around EU 250.00 from local European Markets. Thanks for the info! 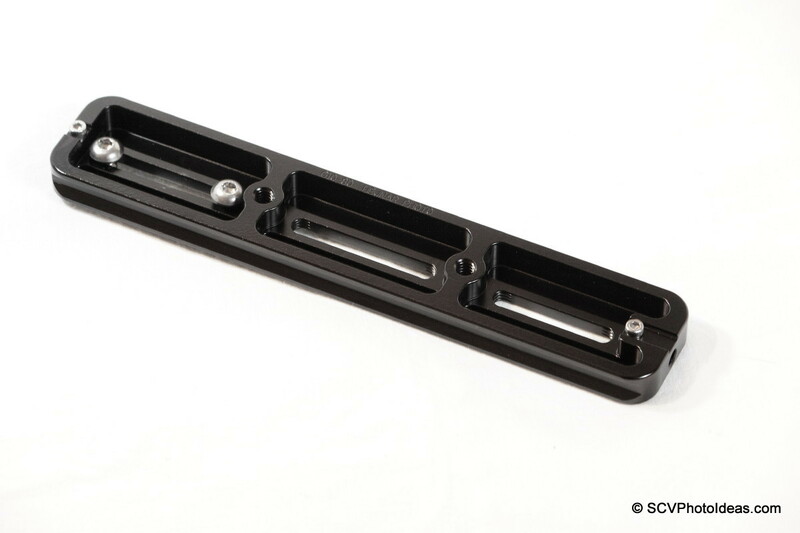 I have purchase rails from Hejnar Photo off of ebay and they do a great job. 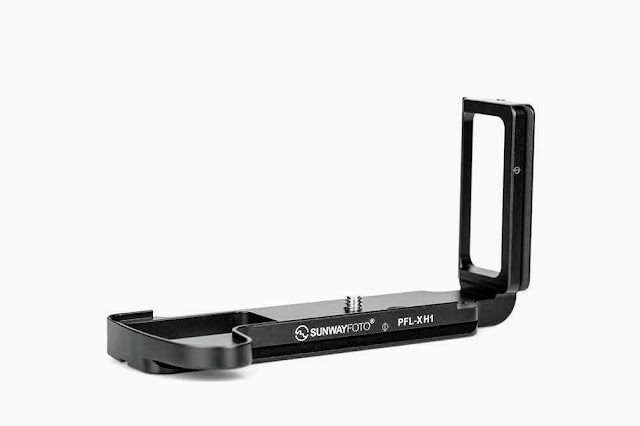 Love their stuff and hope to buy the rest of the pano rails soon. Thanks for commenting. 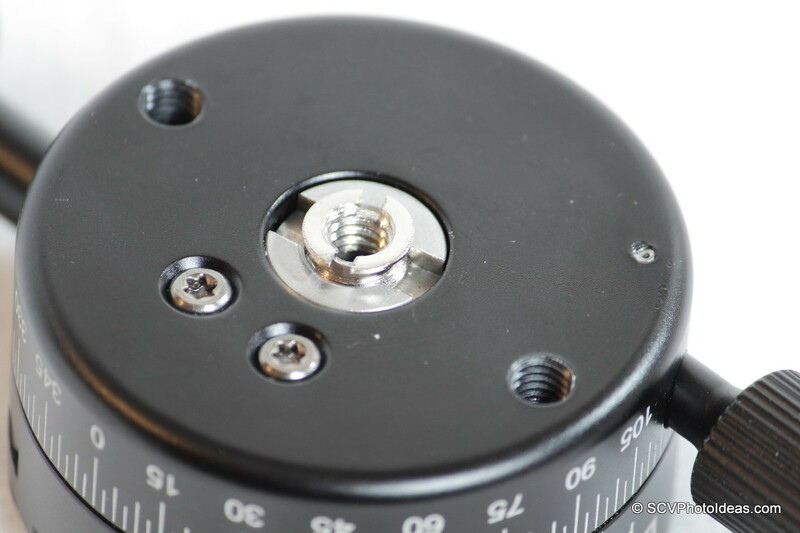 Indeed a very short rail is imperative for fisheye lenses. This was the first attempt back in 2010. More options were discussed with the updated versions since then. Check the "Relevant Articles" above for more info.